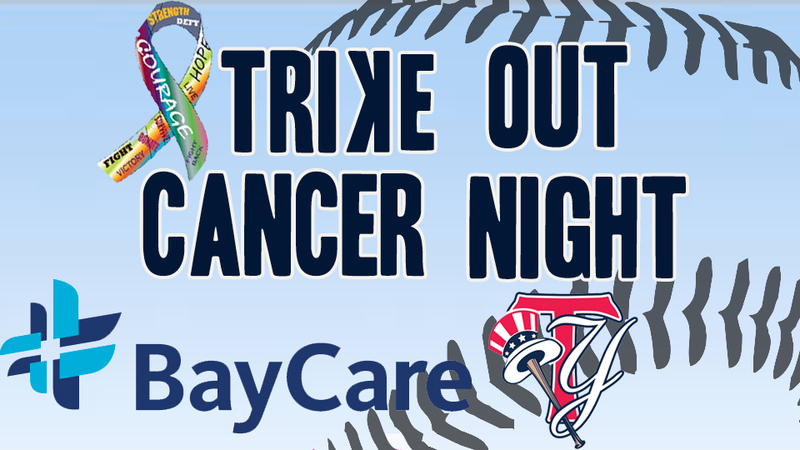 Tampa, Fla. - The Tampa Yankees team up with BayCare for "Strike Out Cancer Night" on Saturday, June 3rd, in support of cancer awareness and research. Gates open at 5:00 p.m. and the T-Yanks take on the Jupiter Hammerheads at 6:30 p.m. After the game, fans are invited to stay for a fireworks show, presented by Avis and AIG. Players and coaches will wear custom "Strike Out Cancer Night" uniforms. Five select jerseys will be auctioned online at tampayankees.milbauctions.com; all others will be entered in a silent auction and available for bid at the game. All proceeds from the jersey auction will benefit cancer awareness and research at BayCare. "BayCare is a leading not-for-profit health care system that connects individuals and families to a wide range of services at 14 hospitals and hundreds of other convenient locations throughout the Tampa Bay and central Florida regions. Inpatient and outpatient services include acute care, primary care, imaging, laboratory, behavioral health, home care, and wellness. Our mission is to improve the health of all we serve through community-owned, health care services that set the standard for high-quality, compassionate care." - www.baycare.org. To purchase tickets for "Strike Out Cancer Night," fans can visit the George M. Steinbrenner Field Box Office or by clicking here. Tickets start at $5 for upper reserved seating, $8 for lower reserved seating, and parking is always free.